LUCAS, Richard D. Pvt. --- Serv. Co., 3rd Bn, 508th Prcht. INF., 82nd Airborne Division, Jan. 11, 1945, in Belgium at Haaser, of 410 N. Drake St.
1.: This brief mention appeared in a Memorial Day article commemorating Pennsylvania men lost in World War II. 2. The place name "Haaser, Belgium" is apparently non-existent. 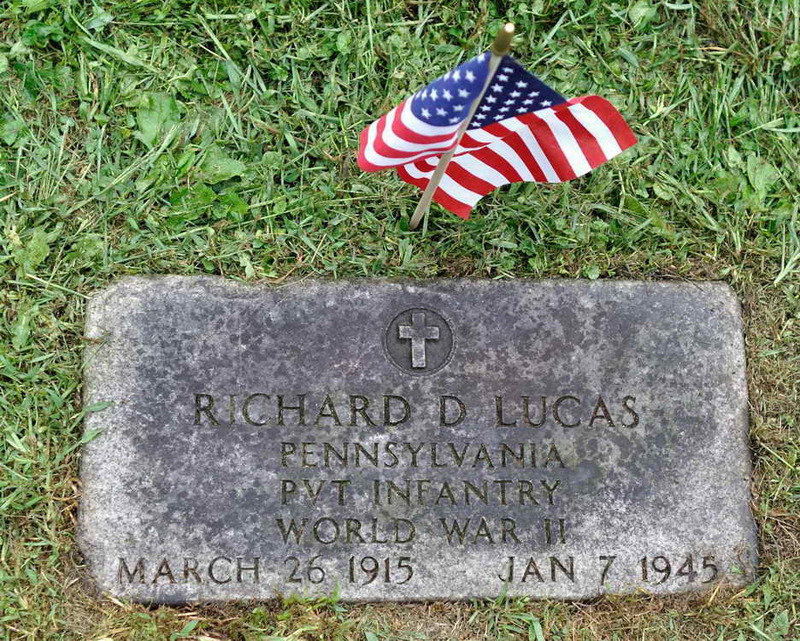 Grave marker for Pvt Richard D. Lucas in the Canfield Cemetery, Van Etten (Chemung county), New York. Richard enlisted in the Army at Erie, PA on 3 January 1944. Pvt Lucas was transferred from Hq 82nd Airborne Division to Service Company, 508th PIR on 3 October 1944. He was later transferred to Company "I"
Pvt Lucas was seriously wounded in action in Belgium on 7 January 1945 and was listed as "Died of Wounds" on that same day. He was posthumously awarded the Purple Heart.